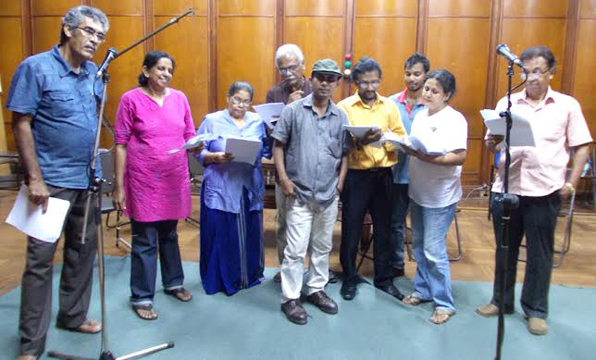 Kanata Parak (Earful of Visuals), a dual audio CD anthology of 14 Radio Plays produced by Malaka Dewapriya, film maker, visual artiste, Sinhala Radio playwriter, short film and video director, will be launched at the Auditorium of the Mahaweli Centre, Colombo, at 3.00 p.m. on April 7. A debut endeavour, Dewapriya is hopeful of creating an aesthetic revolutionary change in the sphere of Radio Plays in Sri Lanka with his CD, which is supported by vocal contributions of nearly 40 prominent artistes. These include Jayalath Manorathna, Dharmasiri Bandaranayake, Saman Athaudahetti, Lucian Bulathsinhala, Somasiri Liyanage, W. Jayasiri, Buddhadasa Withanachchi, Chandra Kaluarachchi, Ramya Wanigasekara, Rathna Lalani, Damayanthi Fonseka, Lakashman Mendis, Saumaya Liyanage, Kaushalya Fernando, Darmapriya Dias, Deepani Silva, Chandrasoma Binduhewa and several others. Theme music for the CD has been created by Lakshman Wijesekara. 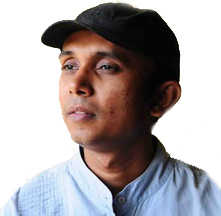 Dewapriya describes Kanata Parak as an artistic attempt to emphasise the significance of audio-media for creating socio-political awareness, at a time when that media has been used for mere popular and commercial purposes. “As an art, Radio Play is one of the most powerful genre in the world today; it is called the eighth art in the world,” he says, adding that though it is said a picture tells thousand words, Radio Plays have the power to produce thousands of visuals in one word, if creatively used. Radio Plays are no longer confined only to radio waves, and explains that one can share it as a sound file and also download it like as one. “If you just go by the information in the ‘www.moonlightaudiothetre.ca’, today, Radio Play has a huge social role. People are made to listen to them while they are waiting to see their doctors in hospitals, in long flights, in long road journeys and in any place people have to waste their time, they can be made to listen to radio plays. So it is a popular medium in the world,” he says. Dewapriya, who entered the world of Radio Plays as a script writer in 1995 and has been active in field ever since, says until 2005 he produced scripts for the program called Guwanviduli Rangamandala for the Sri Lanka Broadcasting Corporation (SLBC). He both wrote and acted various roles. Dewapriya received guidance from the giants of this field like Sugathapala de Silva, Tilak Jayarathne, J. H. Jayawaradana and Dharmashri Munasinha. Sugathapala de Silva after going through some of Dewapriya’s plays had once told him, that ‘the initial stage of radio plays absorbed stories from classic short stories, parables, historical plays, or reproducing mere stories available in society in dialogue format’ and advised him to think of the huge place for imagination in Radio Plays and its immense power as a medium. “When I sit to write a script often I am reminded of his words,” says Dewapriya. He has collected his plays in three volumes; Uge Hisa Ivarai ( off with his head), Nihon Sepa Lebewa (may you attend comfort worldly life in Nihon) , and Funsalak (Fun space ). The first two volumes are in print now, he says, adding that they have about 33 plays which have been written with alternative perspectives and themes. 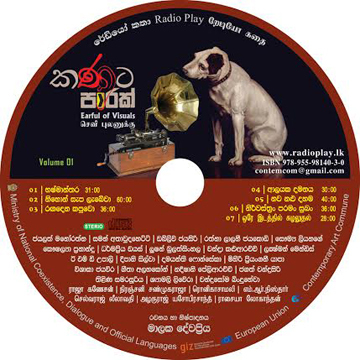 Kanata Parak comprises 12 plays in Sinhala and two in Tamil from Dewapriya’s collection as an audio CD and includes such titles as ‘Tharuwan Saranai’(blessed by star), Nihon Sepa Lebewa (may you attend comfort worldly life in Nihon), Alayaka Damanaya (love tamed), Nirabhishekana (felicitation), Nirwasthran Paraman Sukhan (Naked is the best policy), Funsalak and Roma Ruupana (Perform in Rome). The main speakers at the launch event will be Dr. Dharmasena Pathiraja, Lucian Bulathsinhala, and Dr. Sunil Wijesiriwardana, who will speak on the subject of contemporary radio art. The launch will be compeered by eminent playwright, E.M.D Upali, and all those attending the event will receive a free CD. The launch ceremony is presented by Contemporary Art Commune and is sponsored by the Artlink project of FLICT. With a sheer diversity in her repertoire of songs, Champa Rupika de Silva explores diverse themes like love and filial kinship, enunciating core values of Sri Lankan culture. Mentored by legendary singer Malani Bulathsinhala, she has utilised her talents to inculcate Sri Lankan value in Sri Lankan children in Milano. In a way, it is an aesthetic attempt to reclaim lost motherland in a globalised milieu, while living in the cosmopolitan city of Milano. One of the rare vocalists gifted with a wider tonal range, it is this innate ability that facilitates her to render her voice to a gamut of songs that demands diverse tonality and makes her stand out among her contemporaries. Particularly, she has the ability to demonstrate her skills in the universal scale C. She often employs diverse singing techniques in rendering her voice which, among other things, is the fine application of her knowledge and skills in music. A naturalised citizen of Italy who now lives with her family in the city of Milano, Champa Rupika’s talents were recognised at the age of 19 when she rendered her voice as a light song singer at the Sri Lanka Broadcasting Corporation (SLBC). Significantly, her talents are not confined to singing alone. She took part in amateur singing contests and won all-island awards for singing, dancing and acting. Champa Rupika held her maiden solo-concert titled Mathakaye Randa in Teatro San Carlo, Milano in 2008. 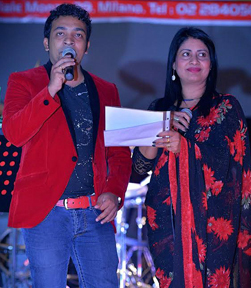 It was a concert held in the memory of her music teacher and mentor late Visharada Malani Bulathsinhala. She also held another concert in 2011 in memory of Malani Bulathsinhala coinciding with her 10th death anniversary. 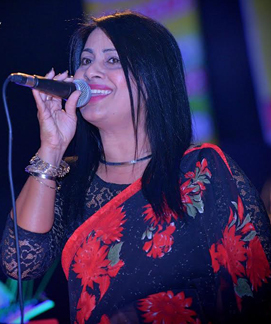 Champa launched her maiden CD in Sri Lanka titled Mathakaye Randa. Champa Rupika completed part one of the Visharada examinations and followed the Gandharwa examination up to diploma level. Her first visual Tharu Mudunaka with Kasun Kalhara Jayawardena was launched on ITN. A popular music teacher and singer in Italy, she recently sang duets in the Sanda Vilasa concert held in Italy with veteran singer Lakshman Wijesekara. She also conducts music lessons for children, particularly, in the Sri Lankan community and holds a highly successful annual music contest titled Little Star in Italy. She is hopeful of continuing with the contest in the future. It is a universal truth that the world’s best entertainers, the truest artistes, the most passionate performers challenge themselves over and over again. Every now and then they step outside their comfort zone; they take risks . . . and they carry their audiences with them on awesome, passion-filled emotional journeys. 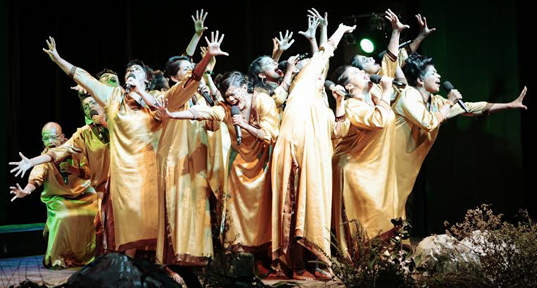 Which is what happened on the March 17, when the Soul Sounds, Sri Lanka’s much celebrated highly awarded premier female choir put on a riveting performance they called Born Free. Born Free was perhaps ‘born’ when the troupe made a safari to South Africa and experienced animals in the wild. Perhaps the idea of a musical safari was rocking around in their imagination even then. And so it happened that the Lionel Wendt theatre was once again filled to capacity one brilliant Thursday, with audiences clearly enchanted by the title. It was from the Michael Jackson medley: the Earth Song. It was appropriately earthy and hugely energetic. And then the singers gathered into position on stage and suddenly quietened to pause for Shehara Liyanage’s silvery voice as it lifted in solo and she began the Earth Song in earnest, beautifully lit up by the whole choir. Yes, the Soul Sounds were clearly different, dazzling, their faces exotically painted. The harmony, the tonality seemed to take on a different timbre. Tossed aside was their characteristic swing and sway movement. Instead they lunged, prowled, made looping movements with their bodies. They threw themselves into a new idiom, and wove into vibrant new group postures, while they sang. And then they moved on to Colours of the Wind from the movie Pocahontas, which Amandi Caldera began with her tender soprano, beautifully supported by the choir. And so Born Free reigned free. A different colour from before. Drum tattoos, animal slides in huge backdrop, imaginative choreography and much more dramatic stage craft, creating a whole different character and mood. Dinushka Jayawickreme’s solo of Michael Jackson’s Will you be there with choir, was haunting. It was more than a song. More than lyrics. More than movements. Climaxing with Lilanka Boteju rendering the perfect piece of poetry . . . to bring a lump in the throat to many a listener. After I dream by Lisa Firestone sung very lyrically by Amandi Caldera and the choir, the Soul Sounds closed the first half with a rousing performance of one of their prime signature pieces: The Lion Sleeps Tonight complete with the background sounds of live forest creatures, which only the Soul Sounds can do with such perfect timing and such raucous artistry. It was one of the numbers which won them the Gold at the Austrian Choir Games some years ago. After the interval the beautiful repertoire continued, lit up particularly by two items. One by One from the Lion King, half sung, half elocuted by Dinushka in native African idiom. Afterwards the High Commissioner for South Africa, Geoff Doidge, Chief Guest at the Concert was heard to comment how authentic her accent was, how real and amazing it felt. This was followed by an original composition by ‘Soul Sounds’ Founder, Musical Director, inventive genius and pianist extraordinaire: Soundarie David Rodrigo. She called it Wild and Free and it beautifully captured the elemental wildness, the unexpectedness of the forest. With drum tattoos that spoke, and piano that shivered and quivered. With extraordinary timing that captured the unexpectedness of the wild. Nilanga Jayawickreme joined her sister Dinushka for Africa Many younger singers were also featured as soloists, as much as the experienced seniors. So we heard Raaya Gomez, Roshani de Silva, Nimaya Harris and Manisha Seneratne . . . They brought a freshness and innocence that was entirely right for this particular presentation. It was a night to enjoy and think about. There was rambunctiousness as well as quiet. There was mystery and unexpectedness and intrigue and subtlety. Soul Sounds challenged themselves and came through magnificently. The really beautiful face paint seemed to transform the young women. Inside and out! Yet the presentation was never over the top. Not overdone. The choreography deserves very special mention. It was just theatrical enough and sensuous enough to turn a human female singer into almost a sinuous creature of the night. This April the Sri Theatre team will perform 21st Century Monk in Kandy. The play is a comedy that observes the life of a young Lawyer and his decision to go forever mute. The production premiere in Kandy two years ago and is back on boards. 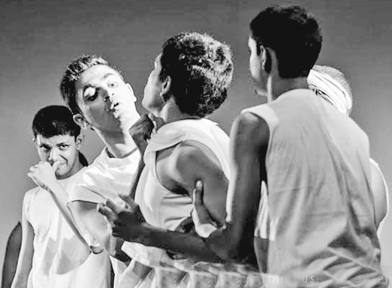 Last month the team was invited to perform in India at the Garden City College University where the play was well received with people in the crowd whistling and applauding to a domestic scene in the play; confirmation of the similarities in our culture. The play will be performed at the E.O.E Pereira Theatre E Fac Peradeniya University on the 9 and 10 of April. Tickets are prized at 200 500 and 1000 and will be available at the gate.